hicago 2006, young people audition for roles in a reenactment of the first televised revolution, the 1989 Romanian revolution. 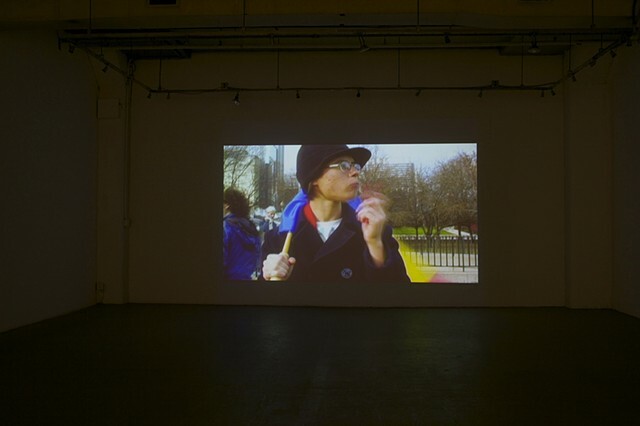 In the piece, the Romanian artist, who witnessed the events, juxtaposes actual footage of the revolution* with reenactments of those same televised events by non-Romanian speaking performers. The new performance was recorded on video and also on 16mm film camera, a camera the artist acquired from a documentary film company that quite likely used the camera to film the 1989 revolution. For the artist, the audition is a way to (re)visit the past in a more comprehensive way, not just through the mind but through the body as well. In attempting to re-activate the memory of the body, the artist seeks to open up, explore and reclaim other virtualities, other possibilities, other directions that the moment of revolution might have offered. In doing so, she hopes to discover a way to heal the wounds and release the tension created by this painful past in order to be able to live in the present - as well as understand the present through the past.